This series wouldn't be complete without at least one good failure. Last year, I decided to try the Native American three sisters approach to gardening, planting hills of corn, beans, and squash together. I'll never try that again. The theory is elegant (and a bit like a collaborative spin on rock-paper-scissors.) The corn provides a support for the beans to run up. 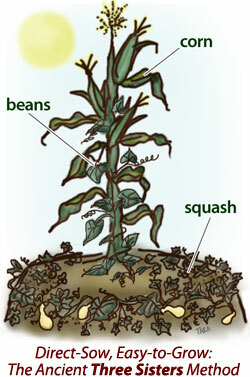 The beans are nitrogen fixers which fertilize the soil for the greedy corn plants. And the big prickly leaves of the squash deter large herbivores and shade the soil. In our real world trial, the plants weren't such good neighbors since the beans and corn were stunted by the massive growth of the squash. The prickly squash leaves did deter herbivores --- humans wanting to pick the beans, that is. We ended up with a huge, sprawling squash patch, nowhere near enough beans and corn, and enough cushaws and zucchinis to feed everyone we know. In retrospect, I made a big mistake in choosing our seeds. Three sisters was practiced by Native Americans growing old varieties --- we're talking field corn to make cornmeal, not sweet corn, and runner beans, not bush beans. The problem is, we prefer the taste of the less aggressive sweet corn and bush beans. I'd rather use the method as the basis for a crop rotation, keeping each type of vegetable in its own bed each year. But I was glad I tried it --- permaculture is all about experimentation!